When I recently mentioned I was looking for new jeans, a few of you recommended Everlane jeans. 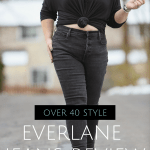 I am familiar with Everlane; a couple of years ago I did an Everlane review focusing on tops as back then Everlane only went up to size L and I knew no bottoms would fit my body. Everlane now goes up to XL and a size 33 in their denim and several styles have ankle and long lengths. However, as a curvy person who, depending on the brand, could be a 10 or a 16, I wasn’t sure if Everlane jeans would fit me. UPDATE: A lot of you complained that you couldn't peruse the Everlane website without registering. There is a faint X on the pop-up on their site. Click that and you can view the site without registering! I reached out to Everlane a few weeks ago as last year they offered to send me some of their clothing and I never received them. They offered to send me some of their new releases including new jeans; I asked in addition to them, a second pair of jeans in a different fit, wash, and denim composition to get a clearer view of Everlane denim in regard to fit, quality, and how they hold up through the day. Everlane sent me their Authentic Stretch High-Rise Skinny Button Fly and Cheeky Straight Jean. To make sure this is a beneficial review, each pair I wore for at least eight hours before the photo shoot so I can show how they may have stretched out. Spoiler alert, neither pair stretched out much! This is a new jean from Everlane; a high-rise skinny jean with an exposed button fly. With an 11” rise, this will give the high-waisted look I was looking for. I also liked the faded black, which looked vintage in a good way. These jeans are made with Everlane’s Authentic Stretch Denim, known for its high elasticity rate and comfortable stretch. I regularly find skinny jeans too skinny on my legs, sometimes so skinny I can’t get them over my feet so to allow for a bit more room and because I am not familiar with how Everlane jeans fit, I ordered them in a 33 waist, ankle length. I should have gotten these in a 32. In the photos, they look pretty good, but the waist and hips are a bit loose and the jeans slid down with wear. However, they never stretched out. They have great stretch but aren’t thin. The wash is… expensive looking. That faded black that takes either years of wear or a very detail-oriented factory. The buttons are exposed but carefully spaced so there’s no gaping or exposed skin, even when you sit and even when they’re tight. Ankle length is 28.5” length which is pretty standard for ankle length skinny jeans but a bit too long for me (wish they carried petite, but then I also wish they carried larger sizes…). I like these jeans. A lot. I wonder if I will like them as much in a 32 or if they will be too “painted on” through the thighs and calves. I wonder if a reason they slide down is that they’re not petite and don’t curve exactly where I curve. I’m willing to try a smaller size and see as these are so good. The Everlane Authentic Stretch High-Rise Skinny Button Fly Jean is available in sizes 23-33, regular and ankle lengths, is made of 87% cotton, 12% polyethylene, and 1% polyurethane, and retails for $78. I wanted to try a pair of Everlane jeans that weren’t super stretchy. Also worried about my curvy legs and skinny jeans, I wanted to see how a straight leg style would work on me. Often I buy straight or slim leg jeans to get the skinny jean effect thanks to my curves. The Cheeky Straight Jean from Everlane is, “Engineered for the perfect rear fit. This straight leg jean has a super-high rise and a raised back hook seam that lifts and tightens. Plus, they feature our Happy Pockets, which are set higher and closer together for a bouncy, lifted look.” I like the look of a bouncy bum so I was sold and asked for these in a 32 to compare, and regular length, thinking I may want to cuff them like boyfriend jeans. These jeans look vintage but not in a good way. These look like the jeans moms wore back when I was in high school. From the high waist and roomy crotch to the old-school stonewashed blue color to the length, these are not my scene. Amazing I can feel both too old and too young for a piece of clothing. Also amazing how these are a size smaller than the black jeans yet are still too big. The only pair of jeans I own this size is a very stretchy pair from a brand notorious for vanity sizing. I find the denim again to be great quality. While this denim is more rigid, it still has give and a hint of stretch which kept these jeans the same size and shape through an entire day of wear. I would definitely try this type of Everlane denim again, though in a slimmer cut like their Cigarette Jean. Also, I’d go with a different wash; I didn’t want super dark or super faded but this is the color blue that is super hard to wear and can quickly look frumpy. 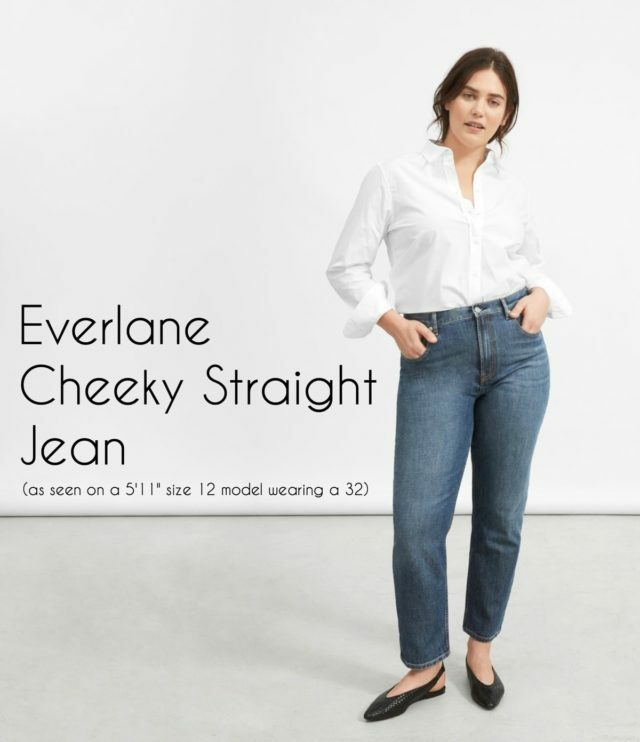 The Everlane Cheeky Straight Jean is available in five colors, sizes 23-33 in regular and ankle lengths. They're made from 98% cotton, 2% elastane and retail for $68. I have respected Everlane‘s business ethics for years. They source the best materials and only partner with the best factories. They are known for their transparency; visit their website and you can learn about each factory they partner with, where it’s located, how many people they employ, and what makes the factory special. Even with great materials made from great factories, Everlane keeps their prices reasonable. We’re talking $100 cashmere, jeans under $80, quality leather totes under $200, and buttery leather boots and shoes all under $250 (and most under $200). Since my previous Everlane review, I’ve heard sizing and quality has become more consistent. Along with these jeans, they sent me a cashmere crew and a pair of their Day Glove flats. The cashmere is higher quality than that from Halogen and department store brands yet comes with that awesome transparency. The shoes are incredibly soft and beautiful and I was shocked to find they fit my wide high-volume feet yet my friend with narrow feet also loves them. The reason I haven’t reviewed or featured Everlane before (other than my review and the one red leather clutch I have from the brand) is because of their minimal sizing. Until recently, I was consistently a 14/16 and Everlane didn’t fit me. A good percentage of Wardrobe Oxygen’s audience is over a size 12 and because of that, I choose to focus on brands that offer at LEAST a size 18. Since my 2016 review of Everlane, the brand now offers XL and up to a size 33. Not enough of a range to make me happy, but at least they’ve made some progress. I hope to see Everlane continue to extend their size range as people of all sizes and shapes want and deserve ethical and transparent fashion. I'd like to use this post as a PSA that in 2019, fashion rules are meant to be broken. Get rid of all those archaic rules in your head, the ones that don’t let you wear this or that because it may make you look shorter or fatter or whatever-er. Those rules that say if you wear X you can’t wear Y, and that at a certain age you need to retire certain silhouettes or brands. Those rules that you felt made you look polished and slim in fact may be aging you and not showcasing your body or your personality in the best light. For example, I've regularly read that if I am short waisted I should wear a lower rise, and if I have a belly and large rear I should wear a straighter jean to balance it out. I think these photos above are proof that such rules do not need to be obeyed. The biggest fashion trend of this decade is having individual style, wearing what makes you happy not what you were told in a book two decades ago would elongate your torso or minimize your hips. Breaking these rules may be the best thing to ever happen to your personal style and your relationship with your body! The gray button-fly jeans continue to be my absolute favorite. I did go down to a 32, but I have washed them a few times, and chose to take them on a trip where I knew they’d be worn for a long day because they keep their shape, are comfy, and look good. I wish they came in 50 colors I’d buy all of them. However, I haven’t worn any other style long term. I enjoy your blog so much its the first thing I open when I have my coffee, before my kids are up. I wanted to comment on reviews; sometimes it seems like you wear clothes for much longer before doing a review (like the Lyssom flats). But with jeans, I don’t know if I trust a review from one wearing, even if it’s 8 hours. It doesn’t seem like enough time to wear the pants, wash them, wear after washing. I’m mentioning this because I bought a pair of Chicos trousers from the blog recommendation and after a couple of washes and maybe 6 wears, the hem is falling down. They aren’t cheap! Did this happen to yours? As an aside, you should do a post on quick fixes like hem tape! I also have the Everyone cheeky jeans in black and think they look good, but agree they are a bit weirdly loose and structured. I wear them to work (I don’t like a super skinny jean). I am trying to be mindful about what I buy, and your blog makes me want to shop (kudos to your style, photos and writing), but I also need truly tested stuff so I really appreciate your transparency about how long/how you’ve worn the items. Great feedback Katelin, thank you. I usually base the length on fit and comfort versus how well they’ll hold up in the long run. It’s hard because that ends up having reviews months after the items are often still in stores. I haven’t had any issues with Chico’s, I’m so sorry that happened to you. It could just be a glitch, since big companies have things mass produced things, unfortunately, can happen like that and at every pricepoint. I’ll be sure when I feature items more than once to share how they wore with time and washings! I have been an Everlane shopper for more than three years, and find that little by little, those clothes and shoes are my faves. Admittedly, I was in their original size range, as I usually wear a 6 or 8. (Yes, you do have some smaller readers who love you too.) But I am sometimes hard to fit, being very long-waisted and sort of hour-glass, with somewhat of a skew towards being pear-shaped. So, with that in mind, I will say that last fall I bought a pair of those high-waist stretch jeans in black, with a zipper (they didn’t have the button version yet) and I adore them. Like you, I find them well made, and they stretch but don’t bag out like other black skinnies that I have had. Yay! I love how these look on you. I appreciate the last part of your post, where you encourage us to wear what we love, and damn the traditional fashion rules. This hits me specifically because I worry that at age 61, I shouldn’t be wearing these skinny jeans without sort of covering up my bum, because I don’t want to be “trying to hard” or something. So I find myself wearing something longer on top with these jeans, and I wish I would just be brave and not do that! I am going to listen to you and try. Thank you Linda. Glad to hear you also like their jeans! The black jeans work the best on you. The straight leg blue really does look like Mom jeans. Right? Straight out of an SNL parody! Isn’t it weird how different colors fit differently? I’ver experienced that as well! Those stretch high rise skinnies look fab on you! I think it’s worth a shot to try a size down. I haven’t tried Everlane’s newer denim offerings. I’ve only tried their regular midrise skinny jean and wasn’t a fan of the non-stretch denim. I’ve got a booty and hips, I need a little stretch. I’m tempted to try again and get a pair of the authentic stretch jeans…I love the way you styled them and OMG, that washed black with the button fly…reminds me of a pair of levi’s i had and LOVED in 7th grade! Thanks Lindsay! Yeah, their new denim is pretty fantastic, and the button fly also reminds me of a favorite pair from my school days! Hurrah! I’m glad that you found some items you like! I have the regular and stretchy high waist ankle skinnies and love them! I hope they keep expanding the size range. I have to admit, my first thought is that those aren’t flattering at all. My eye hasn’t re-adjusted to higher waists coming back in and the emphasis they give on the tummy. If you like them, more power to you, but I’m not quite there yet. I get it, high waisted JUST started feeling right to me, and they are not for everyone. As for sizing up, another reader shared this article with me and it really shows how one or two more sizes actually costs a great deal, and the smaller the brand the harder they’re hit: http://blog.sotela.co/why-expanding-our-sizing-isnt-as-simple-as-it-seems/ I’m not excusing them, they’ve been around long enough to add more sizes but with research I’m finding it’s not as easy as I originally thought to add just one size. As for the sizing, as I mention in the post I find they actually run large. I am usually a 32 in Gap and other retailers, got the 33 in the black and they’re too big. The blue I got in a 32 and they are also large. So if someone had those exact cheeky jeans and kept them, thinking they could pull off a mom jean kind of vibe, what would you recommend they pair them with? I do Madewell high rise skinnies all the time, but you’re right–these are different. But I do love the back of them and the more rigid denim. – White shirt like above, though I would add a camel or tan belt and a pair of close but not perfectly matching loafers or brogues. – Slub knit v-neck t-shirt half-tucked, loafers or brogues, optional lightweight longer cardigan. Shirt could be replaced with a graphic t-shirt if it’s lightweight, not too boxy, and drapes well. – Silky or drapey tank or camisole, jeans cuffed, fabulous pair of heels or embellished slides and some badass earrings. – Chunky cropped sweater to show the waistband and a pair of ankle boots or a shoe with more substance.